Ratatouille - Home. Made. Interest. 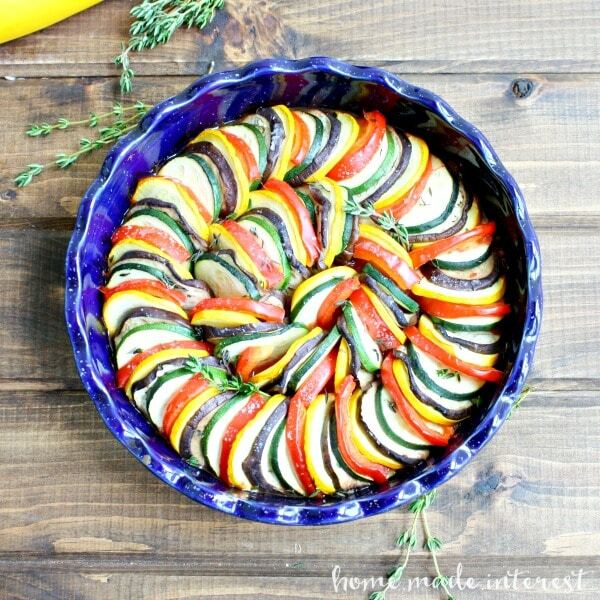 Ratatouille is a light casserole of fresh vegetables. Vegan and gluten-free! This is one of those recipes that I didn’t plan to make, it just kind of happened. I stopped at Food Lion just to grab one thing and as I walked through the produce section it was filled with all of these gorgeous summer vegetables. Yellow squash, zucchini, eggplant, bell peppers….they all looked so good. As I picked up a few squash Ratatouille popped in my head and it sounded so good I wound up leaving with a bag full of veggies (I’m going to be honest this happens to me in a lot of stores…). 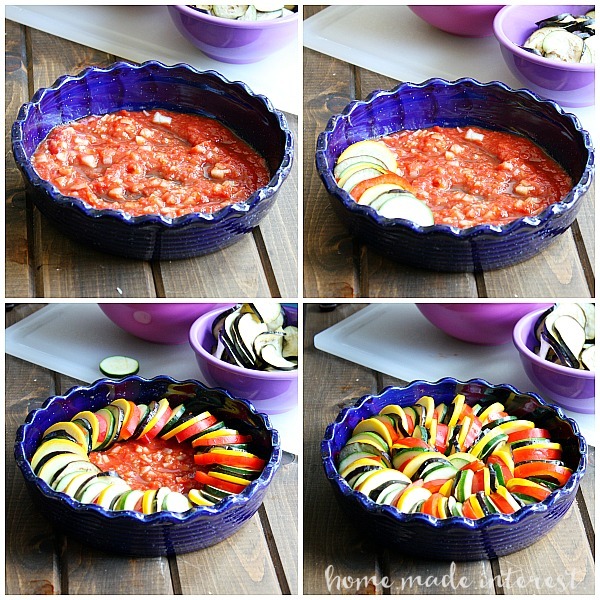 Ratatouille takes a little time to make but it is totally worth it. It’s all about fresh vegetables and it is such a great side or even a light meal. I ate mine for lunch two days in a row :). You’ll want to start by slicing all of the veggies up with a mandolin. A mandolin gets the slices nice and thin and ensures they are consistent so everything cooks evenly. If you don’t have one don’t let it stop you from making this though! You can cut everything by hand if you need to and it will still be delicious. 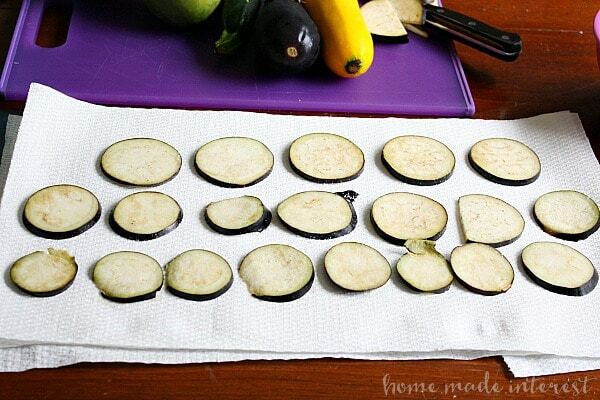 Once you have everything sliced sprinkle salt on your eggplant slices and lay them on a couple of paper towels. Let them sit for at least 30 minutes, more if you have time. Eggplant is a very watery vegetable and the salt will pull that water from the slices so they don’t make your ratatouille all watery. After that is done you’ll mix up a light tomato sauce and pour it into the bottom of a casserole dish. Then you simply add your vegetables to the dish, give the veggies a sprinkle of fresh thyme and salt and put it in a 400°F oven for 40 minutes. You can find the full recipe over at the new Food Lion Recipe Portal. I love the layout of the new site. It is so easy to find what you’re looking for. You can create an account using your Food Lion MVP card (if you don’t already have one you can sign up for one when you create your account and they will mail it to you!). Once you log in you have access to recipes, coupons, weekly specials, and more. The recipe section is awesome. 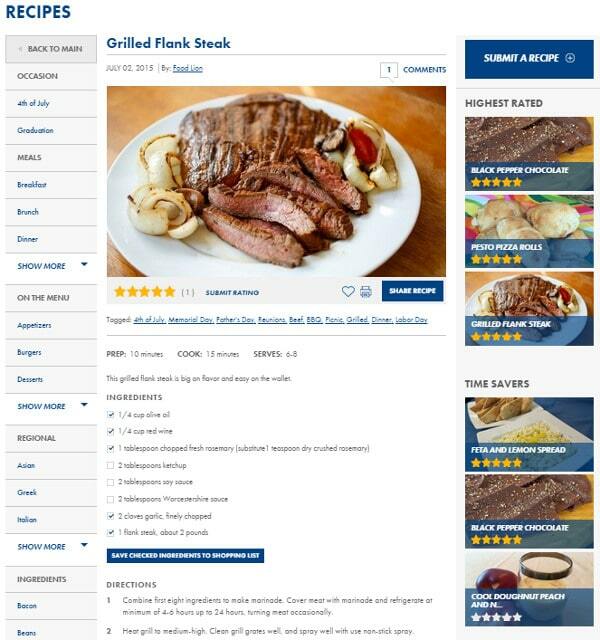 You can submit your own recipes, like I did, and you can see what other users have added. If you like the recipe you can check off the ingredients you need and they will be added to a shopping list. Then when you are ready to head to the store you can print it out and go. Submitting a recipe is easy. 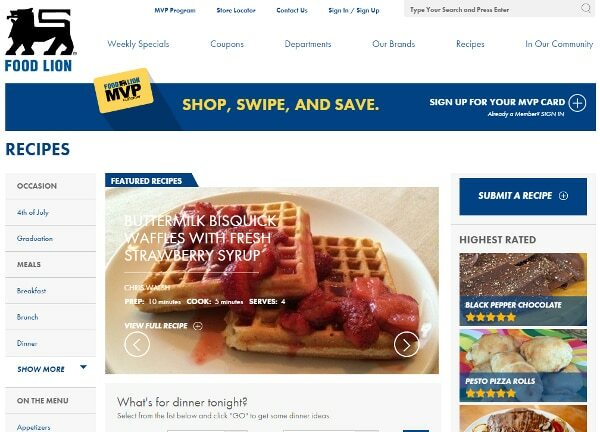 Once you are logged in you click on your name under “My MVP Account”, then on the left side you choose “Submit a Recipe”. You enter a title, picture, description, ingredients, and directions, then press submit. You can see my recipe here. Make sure you check it out and share a few of your own. Another feature that I just love is in the coupon section. You can see what coupons are available, choose the ones you are interested in and then load them straight onto your MVP card. No more forgetting my coupons at home!! Now that you know about the Food Lion recipe portal head over there, make your shopping list, and bake yourself some ratatouille this weekend! This looks awesome! Summer veggies are the best — and I have to admit (hanging head in shame) that until the movie, I didn’t even know what this dish was. Haha! Now that I see it can be simple, I will try it! LOL, I had never had the urge to make it until the movie ;). It is delicious though! What a beautiful presentation is that gorgeous cobalt baker! Thanks for sharing. This looks amazing and perfect all of the summer produce! Thanks so much for linkng up and sharing! Looks like heaven in a dish!! So pretty too! Hello from Creativity Unleashed. Yummmmmm looks so pretty apart from delicious!!! Pinning!!! This is one of my favorite side dishes to make – i don fuse sauce, but rather add some tomatoes. I will try your recipe next time – yumm!! Wow that looks gorgeous, especially in that blue casserole! Thanks so much for sharing on craft schooling Sunday! That is the most gorgeous dish! 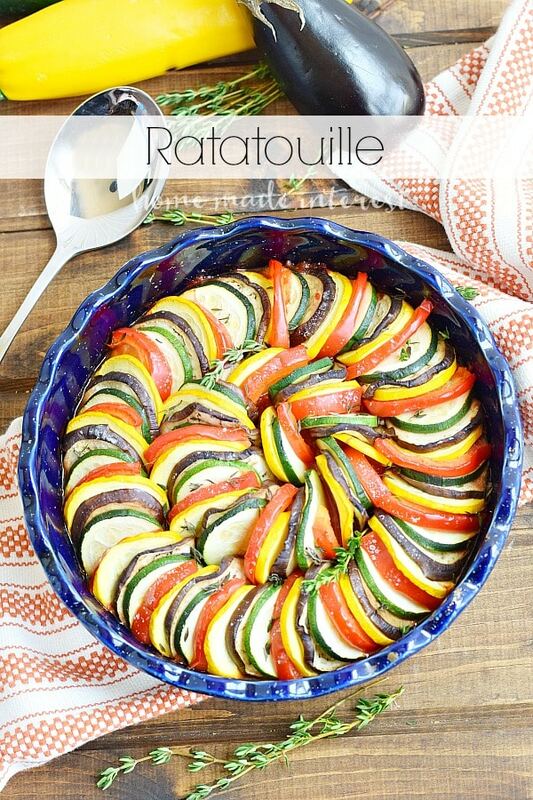 I never thought to try ratatouille,but you make it sound very doable. Great tip about the eggplant! This is a wonderful dish, so colorful, healthy, and happy, and showcases the abundance of produce this time of year. Gorgeous! Of course I’m choosing it as my featured post for this week’s Thank Goodness It’s Thursday link party and I’m heading over to the full recipe now! I’ve made this and it’s now a staple in my home. I am unable to get eggplant where I live at this time of year, so I cut up portobello mushrooms. I didn’t think of yellow squash so I will also incorporate that. Great recipe. Great idea on adding Portobello mushrooms!